Woo-hoo, I love, love, LOVE this dress, and I’m so excited to finally be sharing it! The white version by Jean Paul Gaultier was one of the first pins that I added to my nautical inspiration pin board, and even though it looks kind of plain, it’s by far my favorite outfit from the whole collection. I love the princess seams, the pleats, the ribbon detail, and especially the fun floral lining hiding inside. And of course it never hurts when I save some major cash by making something myself! But what do you think? Did I do it justice? I confess, I felt kinda snooty when I realized that I had pinned a designer dress. I mean it’s hardly that different from something you would find at Target or the Gap, but I’m always so simple and thrifty that thinking about making a knock-off of a “big name” designer felt a little silly at first. I couldn’t find a direct link to the dress since it is probably a few years old, but the Gaultier version is most likely made from a heavy satin with silk ribbon. I’m just guessing, but since it’s being touted as a special occasion dress that makes the most sense. Reli doesn’t have any flower girl plans in her near future so I decided to make my version from a more practical fabric for everyday wear instead. I chose to go with a nice Kona cotton solid (in Jungle) with white grosgrain ribbon stripes. The lining is actually a lucky $2 Walmart find that happened to match perfectly, so I added that in just for fun. Isn’t it so sweet peeking out there? It makes me smile every time I see it. Secret details are definitely going to be added to more of my future projects! or maybe I should have named it the Country Club dress instead! I really want to hear what you guys think about this one. Is it strange to be so excited over such a simple outfit? I adore it so much I’m even considering grading my pattern so I can share it with all of you! Would anyone be interested? Let me know! This dress is right up my alley, so I would love to see a graded pattern! I love the lines, and I love simplicity..so this dress is perfect! great job! I agree! I love cleaner lines for my girls. This is perfection! I love your dress!! It might be simple but it oh so pretty! I would love to see a pattern on this dress. I can also see it in some floral fabric too. Yum! Great job on this project! Oh gosh Christine, Yum is right! Now you've got me digging through my stash making one in every color! What a wonderful job you have done on this knock-off! It fits your cutie perfectly. Love the extra secret details, too! So true Lynette! It was originally planned in red, but I'm so glad I changed my mind. I never realized before, but I definitely don't use green often enough! Thanks Jolanda! I originally planned to make it in red, but that probably would have been too harsh. I don't use green very often, but I'm so happy I did this time! That's sooo cute! I'm always impressed with people that can sew up such an awesome knock-off. I day-dream about having skills like that some day. Thanks Megan! Years and years of practice, plus the nightmare that was design school, and you too can "knock-off" with skill. ;D Ha! Actually I'm always impressed with people who can take awesome pictures, so since you've got that part down (and you can sew) we will now be wonderful friends! I love this dress! I think simple is best. This is a knock off done right. Is this a pattern you drafted yourself? Thanks Darla, That's so sweet! Yes, I did draft the pattern myself, and from the looks of it I'll also be making one to share! I would love to have a pattern for this! It turned out great! Thanks Megan! It looks like I better get started with my grading! What a lovely dress! You did great knock-off, Toni! 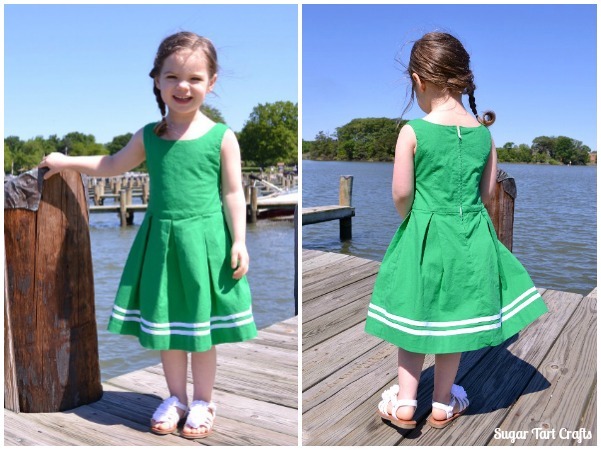 I like your version better and would love if you would share your pattern with us as I do charity sewing for "Dress A Girl Around The World"
Thanks Kathryn! It'll take me a good while to get the pattern graded and tested, but the response have been so positive I'll definitely be sharing it! Thanks Rita! I'm a bit late, but I squeezed in just under the wire! I would love a pattern of this dress. My daughter definitely needs one! I'm adding it to the to-do list, and I'll be sure to send out a call when I'm looking for testers! Thank you Allison! I might be able to sew, but you've definitely beat me in the decor department! This is so so darling!! My daughter and I would love to have this dress!! Great job mama! Come link it up at my party! Thanks Jamie I'll be sure to stop by! Just perfect! I love the color and it looks adorable on your little girl. And i LOVE the lining. I'm a new follower on bloglovin. Thanks Alexis! So glad to have you following! Glad to have you along Therena! This has to go on my project list. Adorable and she models it very well! Thanks Gina! It's great to have you along! Hopefully you'll find plenty of tricks around here to help you with your sewing. It's adorable! I love everything about it! It fits her really well, and she looks like she likes it! Great job! I was surprised, but she actually does really like this one. 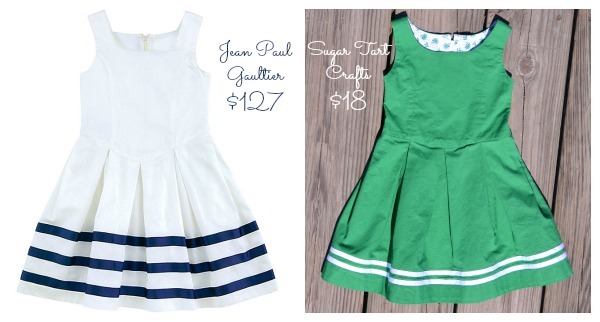 Somehow it's been dubbed the "Tinkerbell dress" though! So cute!!! Would LOVE it if you'd share the pattern. 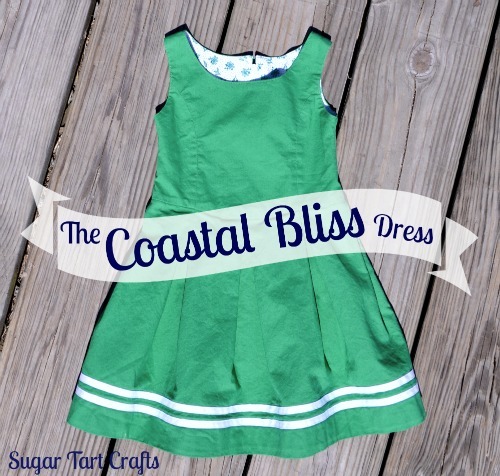 Would love to make this exact dress for my little girl. Love the green !!! Awesome Rebekah! I'll be sure to let you know when it's ready to go! SO cute!! She definitely looks like she could be going to a country club luncheon. Seriously love it! I love the lining! That is my favorite part!!! Great job! Thanks Lindsay, I'm really happy with how it turned out! Can't believe I haven't thought to do it before now. Hi Toni. Great dress. Love the princess seams. Had a quick look around your website, but can't tell for sure if there is a way to find the pattern for this beauty. Is it possible to buy it from somewhere? Hi Martina, I so glad you like the dress! Unfortunately the grading for this pattern kinda got pushed aside in the chaos of buying a new house and moving. I really wanted to have it ready in time for Easter, but it looks like we'll have to settle for summer sun-dresses instead. If you'd like to send me a message with your e-mail address, I'll be happy to let you know as soon as the call goes out for testers. Thanks for visiting! Love this dress, please let me know when the pattern is released. LOVE this knock off! Please do let us know when you draft a pattern as it would be placed first on my list to sew! And the little Secrets are ever so fun! 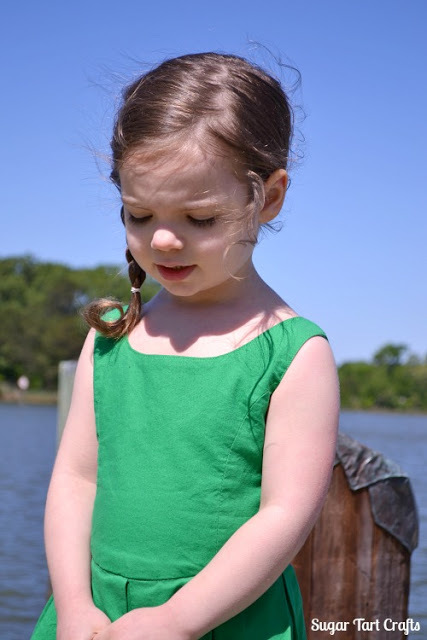 Love to make that dress for my grandchildren Is the pattern (still) available?